As I mentioned in my inaugural post, I want “Hook Me Up Jimbo” to be a resource that provides the local fishing community with information, recommendations, and direction to help further the pursuit of our joint passion – fishing. This week, I want to put a spotlight on a local guide that has reached “Hall of Fame” status in his designated area of expertise – fly fishing. 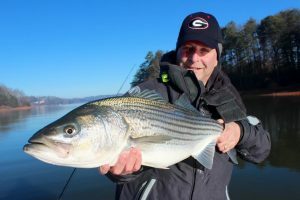 The short bio below will give you some brief insights and introduction to Henry Cowen, a 16 year veteran of guiding on Lake Lanier. Folks, I have had the pleasure of knowing Henry for several years, and he is the best at what he does. Without question, nobody has excelled to the point Henry has in the local market and around the country than Henry Cowen. We are coming into the season where Henry is king – Fly Fishing for Stripers on Lake Lanier. While Lanier is only one of many bodies of water with which Henry is familiar, from now through the winter months and into the spring, simply put, Henry is THE MAN. If you are looking to learn more about the fine art of fly fishing and catch big Stripers in the process, do not miss this opportunity to call and book Henry Cowen, a 40 year veteran of the sport, for a fly fishing trip this fall and winter. He has a national reputation for plying his trade as the BEST at what he does, so call soon as he books up quickly. Read more below about Henry and how to contact to him. Finally, I would like to offer a huge “Thank You” to Henry for his care and concern for our fishery on Lake Lanier. He sets a fabulous example for us all in terms of being a true professional and caring for always doing what’s right – a trait that I greatly admire. Here’s to you Henry!